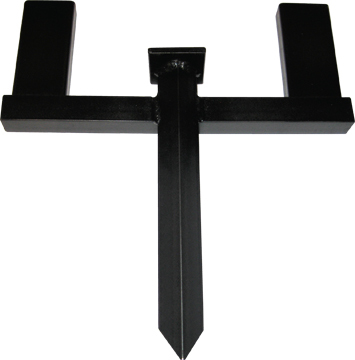 This is our “drive in the ground” version of our immensely popular target stand. No thumbscrews to lose, no sandbags to carry. This stand has a dedicated striking point so you won't beat it up. All you need is this stand and a hammer. Just drive it into the ground and you're ready to go. Downsized to take the smaller 12x20 airsoft paper targets. It measures 12.5x14x3 and weighs 35 ounces. It features a spike and dedicated striking point for driving it into the ground. Like our other products, it is composed of 1x1x1/8 inch angle and 1x2x.062 tubing to accept 1x2 furring strips. Many shooters use these for standard firearms practice as well. These can be used in this manner but are not designed to withstand bullet impact.